Born in Schwäbisch Gmünd, Württemberg, Germany, Emanuel Gottlieb Leutze, a German-American history painter, planned to create portraits of prominent American statesmen early in his career. They moved to the U.S. and settled in Philadelphia when he was still a child. He was a good student but did not take art lessons at first. He only started to draw to while away the hours while he was attending to his sick father. By age 14 he was able to do portraits, for which he charged $5 each. When his father died when he was 15, he supported himself through his portrait paintings. Leutze was 18 when he received his first formal art lessons under John Rubens Smith, a portrait painter who lived in Philadelphia. It did not take him long to be skilled in portraiture and planned to create portraits of American statesmen in Washington although his plan did not meet that much enthusiasm and support. One of his painting attracted the attention of art patrons, which resulted in several orders in 1840. His earnings allowed him to go to Germany and attend the Kunstakademie Düsseldorf. He studied under Karl Friedrich Lessing, a German landscape and historical painter. Two years later, Leutze was in Munich and closely studying the works of German Romantic painter, muralist and illustrator Wilhelm von Kaulbach and Peter von Cornelius. 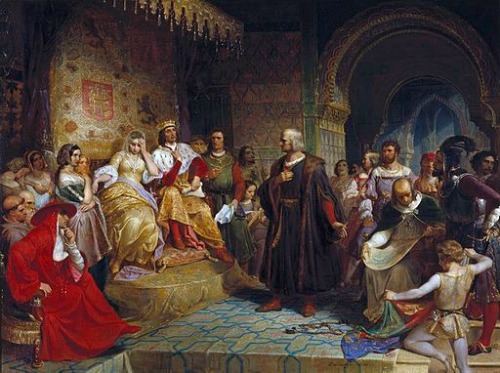 It was in Munich where Leutze finished his painting called “Columbus before the Queen.” In 1843 he went to Rome and Venice to study the works of Michelangelo and Titian. “Columbus before the Council of Salamanca,” his first work, was bought by the Düsseldorf Art Union at that time. “Columbus in Chains,” which was a companion picture to the former, won the Brussels Art Exhibition gold medal and was later bought by the Art Union in New York. It was from this painting that the $2 Columbian stamp of 1893 was based. Italy was the last stop of Leutze’s study tour. He went back in 1845 to Düsseldorf, got married and stayed in the city for 14 years. Being a German-American living in Düsseldorf, he provided help for many visiting fellow American, assisting them in finding places to work and live, introducing them to influential people and at times was their financial and emotional supporter. He was the president of the Düsseldorf Artists’ Association for several years, promoted the Malkasten art association and later helped in the foundation of the Allgemeine deutsche Kunstgenossenschaft. He was a champion of the 1848 Revolutions in Europe and with the idea of encouraging the liberal reformers of Europe through the successes of the American Revolution, be created the “Washington Crossing the Delaware,” which can be viewed at New York’s Metropolitan Museum of Art. He also finished “Washington rallying the troops at Monmouth” that was commissioned by David Leavitt, a banker in New York City and Great Barrington, Massachusetts, who was a significant patron of Leutze. The artist used American art students and tourists as his assistants and models in creating the crossing of the Delaware canvas. There were several historical inaccuracies in Washington Crossing the Delaware. The Stars and Stripes flag of the U.S. was not yet in existence during the time of the crossing in 1776. The flag should have been the Grand Union Flag. Some of the inaccuracies were due to artistic concerns. He used the wrong boat model, which was also too small to be able to hold that many people, although it did portray the difficulties in rowing the boat. The crossing was done at night in reality, while the painting had different light sources. The Delaware River was narrow, compared to the painting and the horses and artillery were actually brought by ferries, not by boat. It was a stormy night during the actual crossing. It was said that the river was modeled after the Rhine. The waters of Delaware form broad sheets of ice instead of the jagged chunks as depicted in the painting. 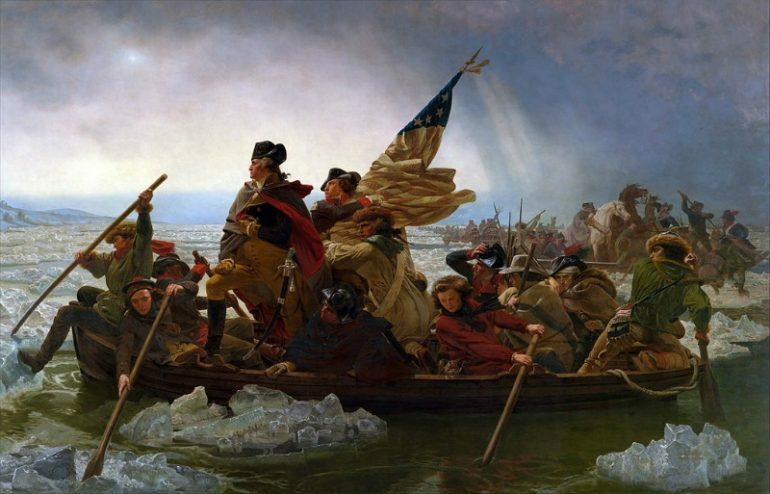 Despite these inaccuracies, “Washington Crossing the Delaware” is the most popular among his paintings and a powerful depiction of American patriotism.